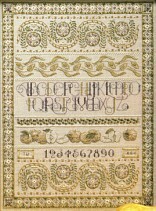 The splendor of harvest time is captured in this sampler stitched in shades of cream, peach, gold, olive and antique violet. Specialty stitches are combined with cross stitch to create several different motifs including wheat stalks, apples, and a novelty alphabet. A border accented with more specialty stitches and beads finishes the sampler.